A new production version of the Mercedes-Benz GLA Concept will launch next year and will be a major rival for the popular Range Rover Evoque. The Mercedes-Benz GLA Concept that just made its global debut at Auto Shanghai 2013 has been a big hit and one of the stars of the show. Mercedes says the concept will become a production vehicle next year and it will enter the very competitive mid-size luxury SUV segment. Mercedes has seen what is happening with the popular 2013 Range Rover Evoque, and wants a piece of that pie. The new Evoque has been wildly popular around the globe and if you look at its design, the Mercedes-Benz GLA Concept looks very similar. Will the production model look like the concept that was recently unveiled at Auto Shanghai 2013? According to AutoCar, they have reported that insiders have said the new GLA Class production model will be 90 percent representative of the GLA production model. It is expected to make its global launch sometime next year and AutoCar says it will be priced around $32,500 (25,000 euros). If this is correct, that will make the new Mercedes GLA Class very competitively priced and well under the $41,995 starting price for the 2013 Range Rover Evoque Pure five-door. It may not only compete with the popular stylish crossover, but could it be an Evoque killer? Mercedes-Benz has made it known that they want to take over the top spot from BMW and Audi as the number one luxury automaker. Right now they are in third place behind their two German rivals. But they are making big strides by introducing the new CLA four-door coupe that will be competing with the BMW 3-Series and Audi’s A4. But they haven’t had an entry in the mid-size luxury SUV market. The new GLA Class will give them the luxury crossover they need to take sales from the Range Rover Evoque. Mercedes-Benz sales and marketing chief, Joachim Schmidt, describes the GLA’s role in the compact SUV segment as “a sporty and more coupe-like evolution of this category of vehicle.” This sounds a lot like the Evoque that set the standard for the new category. Mercedes will have a lot of work to do to catch up with Land Rover. The sporty Evoque has been such a huge success for Land Rover that the British automaker had to add workers and an extra shift to keep up with demand in 160 global markets. The new Evoque has received both media and sales success since its launch and continues to capture the attention of buyers around the globe. The new GLA Class will also compete with the Audi Q3 and BMW X1 around the globe. The new Concept GLA gives us a good idea of what Mercedes has planned for their new 2015 GLA Class compact premium SUV when it launches sometime next year. Mercedes is definitely targeting a new generation of buyers who already are buying the very popular Range Rover Evoque. Now we’ll see if Mercedes will offer the kind of pricing on this new coupe-like evolution that will reach new buyers for the brand. Watch the Mercedes GLA secrets revealed video from AutoCar. 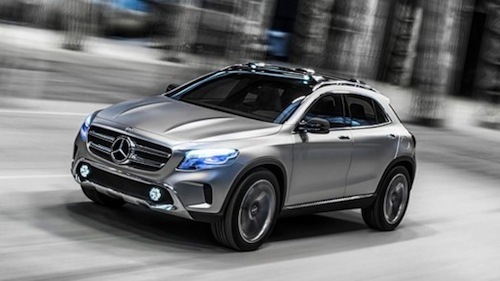 Is it GLA in the same level of those BMW X1 and Audi Q3? Evoque is a rival of BMW X 3 and Audi Q5. How will GLA be the Evoque killer?